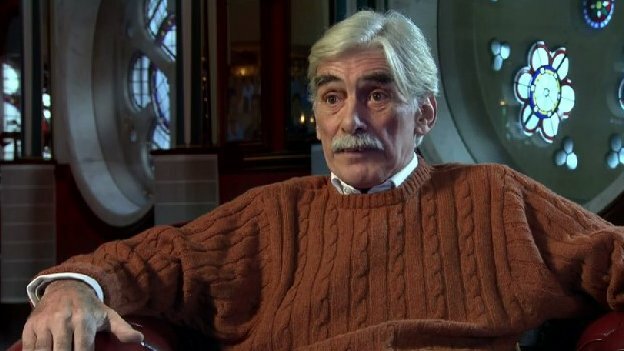 Scottish writer, actor and producer David MacLennan has died aged 65. A driving force in Scottish theatre, MacLennan co-founded the ground-breaking 7:84 and Wildcat companies. He was also behind the hugely successful “A Play, A Pie and A Pint” event at Glasgow’s Oran Mor that has since been copied around the world. MacLennan revealed earlier this year he had been diagnosed with terminal motor neurone disease – a degenerative condition affecting the nervous system. The List noted that “a giant of Scottish theatre has sadly passed away”. McLennan’s death was announced on the day that BBC 2 Scotland is to broadcast “A Play, A Pie And A Pint: Scotland’s Theatre Revolution” – a documentary looking at the work that inspired him. THE SCOTTISH theatre world was united in mourning yesterday after the death of one of its most influential figures. Glasgow-born David Mac-Lennan, who had been suffering from motor neurone disease, passed away in the early hours of the morning. He was 65. MacLennan, an acclaimed writer, producer and director, made his name in the 1970’s with iconic political theatre company 7:84, which he helped to found, and went on to form the musical theatre group Wildcat with long-time collaborator Dave Anderson. His other ventures include being one of the key figures involved in the creation of Glasgow’s annual Mayfest, launching the Pleasance venue at the Fringe and coming up with the hugely popular “A Play, a Pie and a Pint” concept. That was launched at the Oran Mor arts centre when it opened in Glasgow’s west end just over a decade ago and produced almost 40 plays a year, with many shows going on to tour around the world. Announcing his passing, a statement from Oran Mor and A Play, a Pie and a Pint, which has already run to 337 productions, said MacLennan’s work, passion and achievements touched many people’s lives and changed the face of theatre in the UK. MacLennan was jointly masterminding a major project for the National Theatre of Scotland in his final year, inspired by the forthcoming independence referendum. The Great Yes, No, Don’t Know, Five Minute Theatre Show will see around 180 five-minute pieces of theatre performed around the world in the space of 24 hours and broadcast online. “The project, which will go ahead as planned on 23 June, will feature four new short plays especially written by MacLennan, who was married to Balamory actress Juliet Cadzow. David MacLennan, who has died aged 65 after suffering from motor neurone disease, was at the heart of Scottish theatre for over 40 years, as an actor, writer and producer. In 1971 he co-founded the influential 7:84 touring company, with his sister, the actor Elizabeth MacLennan, and her husband, the playwright and director John McGrath. This belief underpinned all his work. For the past 10 years he had run A Play, a Pie and a Pint, an amazingly successful lunchtime theatre project in the west end of Glasgow that operated as both an unofficial wing of the National Theatre of Scotland (formed in 2006) and a platform for international playwrights. Crucially, though, just as 7:84 had its greatest popular success with McGrath’s landmark ceilidh show about the Highland clearances, The Cheviot, the Stag, and the Black, Black Oil (1973), which on tour attracted and embraced the grassroots audience whose lives were the subject of the play, so A Play, a Pie and a Pint brings in two or three hundred Glasgow locals every lunchtime, a mixture of students, flexi-workers and the retired. The formula has been franchised to Philadelphia, with Caracas and São Paulo to come. This success echoes the lunchtime theatre scene in London, and indeed the Pool theatre in Edinburgh, in the 1970s, but is on a different scale. A Play, a Pie and a Pint takes place in the crypt of a disused church, Òran Mór, converted by businessman Colin Beattie into an arts and restaurant venue, with MacLennan casually suggesting the lunchtime idea. Over 10 years, many important Scottish actors, directors and playwrights, including Robbie Coltrane, Bill Paterson, Elaine C Smith, Liz Lochhead, David Greig and David Hayman have joined in, and there is no sign of a let-up. MacLennan was the youngest of the four children of Sir Hector MacLennan, a gynaecologist and obstetrician, and his wife, Isobel (nee Adam), also a doctor and a noted activist in public health. His grandfather, RJ MacLennan, was the editor of the Glasgow Evening News. David was taken to see Peter Pan at the King’s theatre in Glasgow when he was five, and his enthusiasm for popular theatre was further fanned by the Five Past Eight variety shows at the city’s Alhambra, which were produced by the renowned entertainer and pantomime dame Jimmy Logan, who happened to be a neighbour. MacLennan was educated at prep school in Drumtochty and at Fettes college in Edinburgh, where he acted in school productions. He went on to Edinburgh University, but did not complete his degree, opting to work as a street refuse collector, and then as a stage manager at the Gardner Centre in Brighton. Joining McGrath on 7:84 changed his life. For 25 years – latterly with Wildcat, a rock radical company that added music into the mix, founded with the actor/musician Dave Anderson – he travelled the country, organising tours, building sets, driving lorries, working in communities, writing and acting – until, in a change in the funding climate, the Scottish Arts Council delivered summary execution by withdrawing the grant in 1997. Whether this was in response to a perceived decline in quality, a politically motivated clampdown, or a desire to inaugurate change for the sake of it, was never clear. MacLennan and Anderson had been producing two or three rock operas a year, covering such unsurprising topics as the dangers of the nuclear threat, the miners’ strike, loan sharks in Clydebank, and US foreign policy in Latin America. The original 7:84 produced plays by McGrath, Trevor Griffiths, John Arden and Margaretta D’Arcy, and continued touring the UK while McGrath and the MacLennans set up 7:84 Scotland. Notable titles included Little Red Hen, The Ballygombeen Bequest and Vandaleur’s Folly, all highly charged socialist political vaudevilles, clearly indebted to the example of Joan Littlewood in Oh What a Lovely War, a show MacLennan had seen in 1964 in its original production. This body of work transformed the Scottish theatre and it was the smartest of moves, when the National Theatre of Scotland was finally formed in 2006, to include all the energies, targets and creative personnel of the various touring companies and smaller theatres into one operation, but not tied to a single building. The advent of A Play, a Pie and a Pint could not have been better timed – MacLennan had spent a few interim years working as a freelance – and its plays have spread far beyond the Glasgow crypt. The lunchtime Christmas panto was so successful the company inaugurated a summer one, too, claiming a spurious precedent for such cultural barbarism in the forgotten history of theatre along the Ayrshire coast. One of MacLennan’s last projects was curating, for the NTS, with Greig,The Great Yes, No, Don’t Know Five Minute Theatre Show for the referendum on Scottish independence. A television documentary about Òran Mór, narrated by the actor Peter Mullan, was broadcast on BBC Scotland on the day MacLennan died. He is survived by his second wife, the actor Juliet Cadzow, whom he married in 1988, and their son, Shane, as well as Elizabeth, and his brothers, Robert, the former leader of the SDP and now the Liberal Democrats’ cabinet spokesman in the House of Lords, and Keith, a banker. MacLennan passed away in the early hours of the morning. He had been suffering from Motor Neurone Disease for the past year. MacLennan’s reputation in the acting world was such that he was able to attract major talent in the form of Robbie Coltrane, Bill Paterson and Elaine C. Smith to his basement theatre in the West End of Glasgow. MacLennan was married to actress Juliet Cadzow. His sister, Elizabeth, and her husband, John McGrath, were also co-founding members of the theatre company, which pioneered some of the most radical political drama ever seen in Scotland and the UK. Earlier this year MacLennan spoke to The Herald about his hopes for Scotland to remain in the UK and wrote a poem about the indyref. The arts community has today been paying tribute to MacLennan. Actor Colin McCredie tweeted: “The saddest news ever. Can’t believe we’ve lost this giant of Scottish Theatre. David MacLennan a true inspiration & a wonderful man.